Can Dabang Delhi clinch their fourth straight win? At the back of a stupendous home leg thus far, Dabang Delhi K.C will hope to give their home fans a lot more to cherish as they line-up to play their final home game against the Tamil Thalaivas at the Thyagaraj Sports Complex in Delhi. The hosts kick-started their home leg in fine fashion with a 48-35 win over the Jaipur Pink Panthers but after a 34-41 loss to U Mumba, it seemed as if the 'Home leg conundrum' had hit the Joginder Narwal-led side as well. 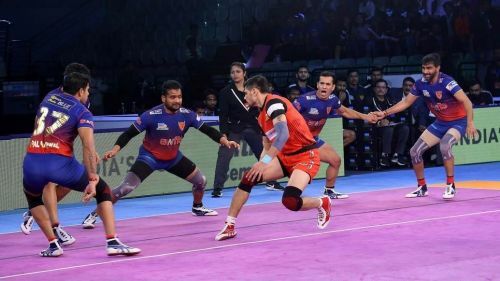 However, that was only some chatter that floated in the air as on the mat, Dabang Delhi looked a solid outfit and registered a hat-trick of wins that has undoubtedly strengthened their claim for a spot in the playoffs. However, their final home leg game against the Thalaivas could prove to be tricky and with the Ajay Thakur-sized obstacle due to be overcome, the experience of the Delhi defenders in the form of skipper Joginder Narwal, Ravinder Pahal and Vishal Mane could come to good use. For Delhi, the onus will be on Meraj Sheykh to continue his top run, which has seen him milk raid points with simplicity and his duel with Manjeet Chhillar will certainly prove to be a mouth-watering prospect on the day. A win for Delhi would certainly strengthen their hold on the third spot in the Zone 'A' table while a victory for the Thalaivas would thrust them to the third position on the Zone 'B' table. Dabang Delhi K.C: Joginder Narwal (C), Meraj Sheykh, Naveen Kumar, Chandran Ranjith, Ravinder Pahal, Vishal Mane, Rajesh Narwal. Tamil Thalaivas: Ajay Thakur (C), Jasvir Singh, Sukesh Hegde, Manjeet Chhillar, D Pradap, P Subramaniam, Anil Kumar. Follow Sportskeeda for all the latest Pro Kabaddi live score, schedule, points table, match highlights and results.